Pink watches women for your beloved sing with you "La vie en rose"
Rose is the color of tender love, full of joy, spontaneous. and of those who have kept their childhood dreams. A symbol says more than a thousand words. The 14 pink sapphires celebrate Valentine’s Day, and the heart set with 3 pink sapphires at 2 o’clock symbolises the love of February. For every woman who feels devoted to the auspicious aspects of Gaja-Laxmi, DELANCE has created a unique “Gaya Laxmi” watch. The pink ruby symbolizes femininity, love, tenderness and happiness. who is happy to be in love. Twenty-eight rose sapphires celebrate the moon’s cycle and femininity. The DELANCE “Pink Ribbon” watch unites women all over the world in solidarity. 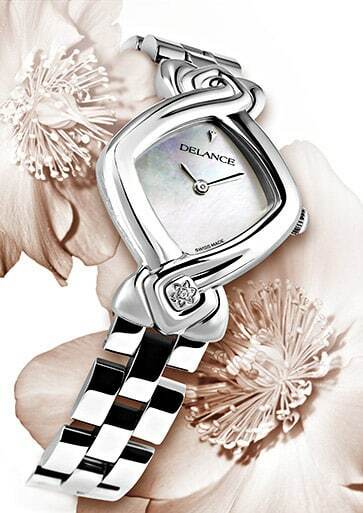 For every unique mother there is a one-of-kind DELANCE watch waiting to be created especially for her. For her 75th birthday, all of my mother’s children gave her a Delance “Just for your” watch. fashioned like a sculpture is immediately recognizable.